You'll make this slow cooker lasagna again and again! So saucy and cheesy! 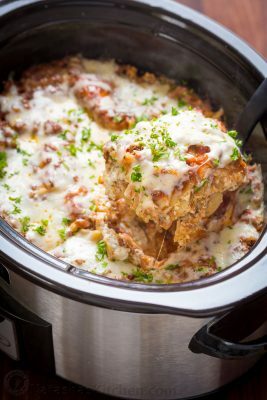 An easy make-ahead crockpot lasagna - the noodles cook right in the crockpot! Can be fully assembled and refrigerated overnight and slow cooked the next day per step #5. 9 lasagna noodles uncooked, NOT "oven ready"
In a large deep pan over medium heat, combine ground beef and onion. Cook, breaking up meat with a spatula until no longer pink (5 min). Add garlic and sauté 1 to 2 mins. Add 1/4 cup red wine and simmer until nearly evaporated (5 min). Make the cheese sauce: In a medium bowl, combine: 15 oz ricotta, 16 oz cottage cheese, 1 large egg, 1 cup mozzarella cheese, and 2 Tbsp parsley. Mix well. Lightly oil slow cooker. Spread 1 cup marinara sauce on the bottom then top with 3 noodles, breaking them to fit. Top with 1/3 of the Meat Sauce, sprinkle with 3/4 cup of your mozzarella cheese, then spread the top with 1/2 of your ricotta cheese mixture and repeat until you have 3 layers of noodles. Top the third layer of noodles with remaining meat sauce, 3/4 cup mozzarella and pour 1/2 cup water around the edges, allowing some of it to go down the side of the dish into lasagna. Cover and cook on LOW 3 1/2 to 4 hours** then top with reserved mozzarella, cover and cook 10 mins or until cheese melts. Let the lasagna rest 15 mins for easier serving. *Important: Do not cook on high! **Cook 3 1/2 hours on low if slow cooking right away and 4 hours on low if slow cooking after having the lasagna assembled and refrigerated overnight.